Metallics have been quite the rage for the past few years. They have made their way into our homes, our accessories, and even onto our nails. 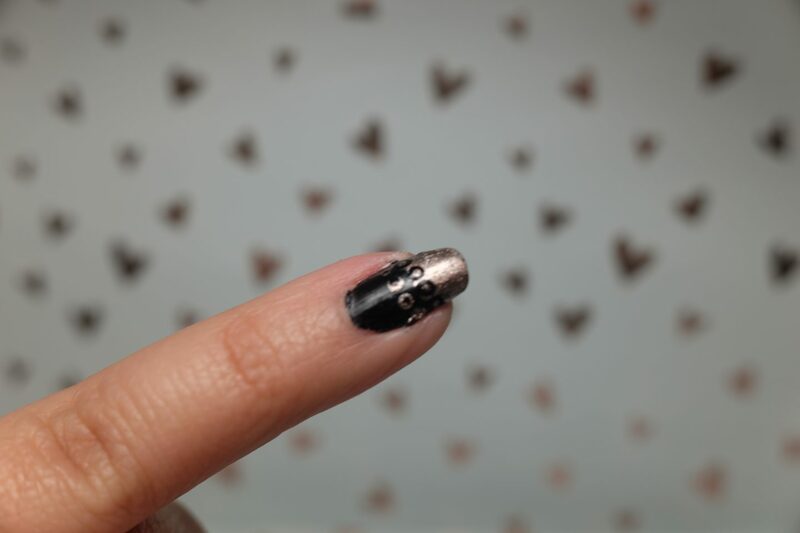 I am by no means a manicurist, but I do love DIY’s which is why I wanted to share with you my amazingly simple take on wearing a metallic accent nail. You don’t have to be an expert, all you need are some very affordable tools and a little bit of imagination. If you are obsessed with all things Rose Gold then the gorgeous shade that I am featuring today will make your heart beat a little faster. 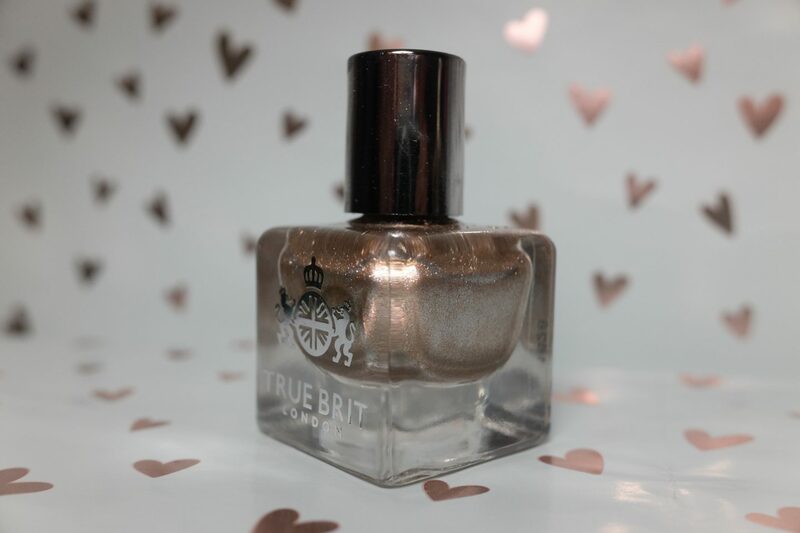 Heirloom from the True Brit London Heavy Metal collection is the perfect way to transition the Rose Gold shade from our interiors onto our nails. Not only is this shade gorgeous (as are all the other shades in the collection) but the premise of this fantastic range of products is that they do more than just polish our nails – they take care of them. Infused with Vitamin E and naturally nourishing flower oils the True Brit London products take good care of our nails. If you are looking for a nail polish free from carcinogens this brand is exactly what you need. They take their inspiration from all things British which makes the heart of every Anglophile (like myself) very amused! For these looks, I gathered 3 nail varnishes, a top coat (not pictured), and some dotting tools. 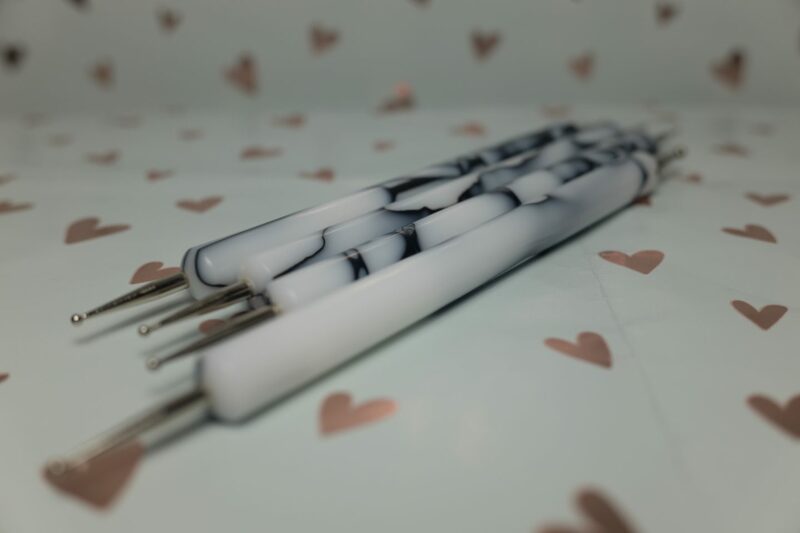 The dotting tools that I used are these really nice looking marble effect ones that I found at none other than Poundland from their Makeup Gallery product range. 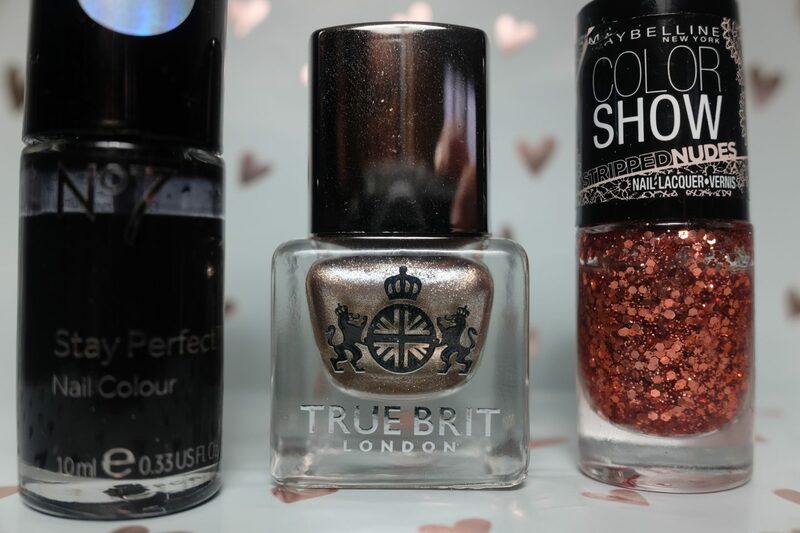 I also used my favourite black nail varnish No7 Stay Perfect in Black Patent, Maybelline Colour Show Stripped Nudes in Bronze Me Up, along with Heirloom from True Brit London. The last tool that I used that may seem a bit unusual is a makeup sponge. I love to have these on tap and picked up a bag of 30 from one of the pound shops I believe. I don’t use them for my face, but they are perfect to use for instances like this. I love this look and would consider doing an entire manicure using this technique not only an accent nail. For this look, I started with a base coat of clear polish, then proceeded to give my nails 2 layers of Heirloom from True Brit London. Once the polish was completely dried I took one of my wedge makeup sponges and carefully poured some of the Bronze Me Up polish on the thinner part of the wedge. 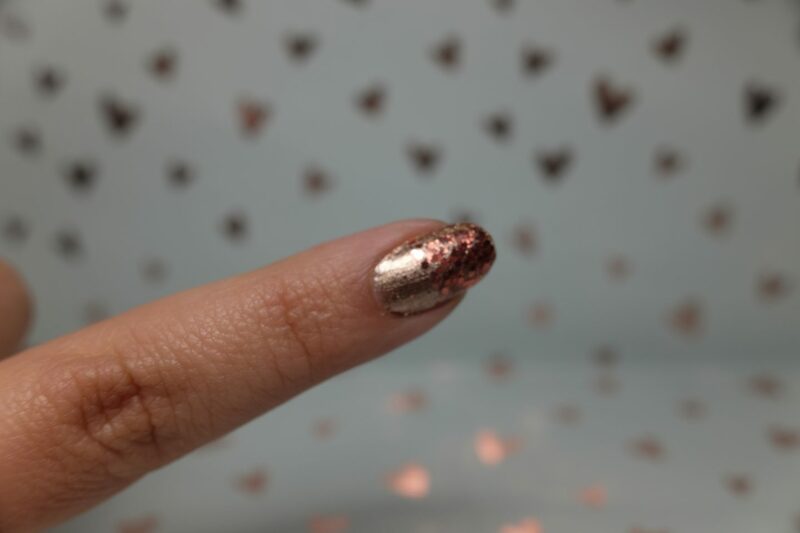 I find this technique the perfect way to get those beautiful chunks of glitter onto the nail without having to give your nail layer upon layer and not reaching the desired effect. I placed the big chunks from the middle of the nail towards the tip and then used the brush to add a few specks of small glitter towards the nail bed. The key is that you must allow it to completely dry. Once dry give it a top coat and that look is done! This look is so much simpler than it looks and it gives you a nice finished product. I achieved this look by using 2 coats of the Boots No7 Black Patent nail varnish. Once dry I took the smallest nail dotting tool and dipped it in a small mound of nail polish that I had emptied out onto a disposable plastic bowl. 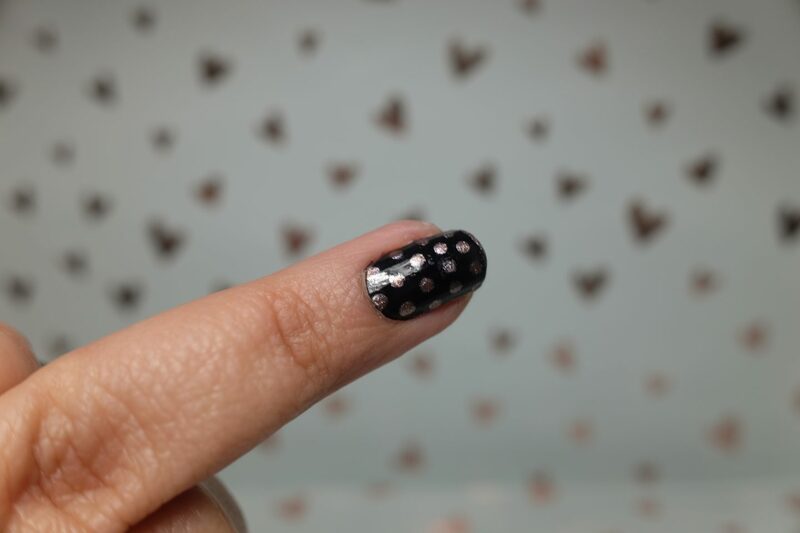 Once I had the polish on the dotting tool I began creating a pattern on the nail. The key is to dip the dotting tool back into the polish after each dot to ensure that the colour is even throughout. The more dots you make with the same varnish the lighter the look of the dot. After it dries completely then give it a top coat and that look is all done. I love the ease of this look and the final product looks as though it took much longer than it did! I love this look! This one takes a tiny bit more effort than the previous 2 but looks really interesting once it is finished. For this look I gave my nail a coat of the Black Patent polish, then once that was completely dry I took the Heirloom shade and gave the nail 2 coats from about midway to the tips. I did it freehand which is why the line isn’t completely straight, but I ended up liking the imperfection. Once that was completely dry I decided to jazz it up using my dotting tool. I took 2 of the smallest dotting tools and following the steps from the previous look I created dots in opposite colour on either side of where the 2 colours meet. Once that was completely dry I used the smallest tool and added dots in opposing colours. As always, allow to dry and give it a top coat.